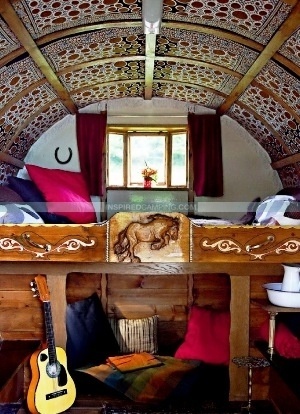 Gypsy Caravan Camping At Fisherton Farm - Inspired Camping. Roulettes, Vardos, Bowtops, Gypsy Caravans and Romani Wagons were traditionally horse-drawn houses on wheels for Gypsy travellers. They were often made and insulated with recycled and natural materials and elaborately painted. These were perfect vehicles for a nomadic lifestyle and were the first horse-powered caravans, which have since developed into one of the most popular forms of camping today. As humans we wouldn’t have spread across the globe if we hadn’t been compelled to travel from place to place. We’ve had to become travellers, adventurers and campers to survive and the gypsy caravan helped achieve that. In today’s civilised society you might think we couldn’t be further away from those days of roaming the land, but we’re closer to our roots than you might think. It’s the nomadic instinct buried deep within all of us that drives us to travel, to seek shelter, to start a fire and to cook food. This is part of the reason why many of us love to go camping and glamping as it helps to nurture our natural instincts. Basically cooking over a fire, simplifying our lives, sleeping and waking with nature is what we all need to do every now and again. One place where you can find this opportunity is at Fisherton Farm’s Vintage Vardos in North Devon. 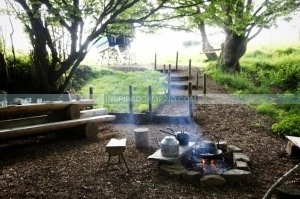 Their gypsy caravan camping provides you with your own private meadow next to a stream and woodland trail, so you have every opportunity to really get in touch with nature, find some solitude, to switch off and simply to breath. 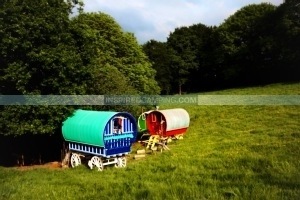 The vintage Vardos are Bowtop gypsy caravans and are traditionally Romany in style. Painstakingly restored they have their own personality and charm and ooze romance of a time long since forgotten. A time when we had to be nomadic survivors rather than desk junkies. The Vardos are nestled in a meadow as idyllic as the caravans themselves. For residents there’s also a sheltered outdoor living room with a campfire and table seating. Facilities also include a secluded day bed, hot showers, toilets and mini library, giving you plenty of opportunity to explore the surroundings on timber walkways, paddle in the near-by stream and simply to relax. There are three gypsy caravans. Big Ted is more than 100 years old and is decorated in a traditional style, with embroidered cushions and a deliciously comfortable elevated bed. Little Gem was built in the 1940’s and is funky, fun and full of colour. Red Rum, also from the 1940’s, has more of a macho feel with sheepskins and earthy tones. Fisherton Farm is owned and run by Gavin and Jemma. Gavin is a rare breeds farmer and Jemma is an accomplished artist having exhibited all over the world. Their Bowtop caravans were recently featured on the series Amazing Spaces with George Clarke, and remain a popular destination for many visitors to Devon. For more information on Fisherton Farm and booking their caravans for 2013 you can visit their website or contact Gavin directly through Twitter.